I hereby would like to thank you very much for sponsoring me the money which has enabled me to sit my Pitman exams. I have received a pass in English, but in the Mathematics area I have failed. But I am planning on doing it over next year, God willing. My manager is already planning to send me to college, so that I can further my studies in Secretarial skills. Without your help, I don’t think that I would be dreaming of this day. A new start with the Trust Sadie Charles (left) went from 17th to 1st place in her class at St David’s Secondary School after receiving help from the Trust to buy her school books. Sadie will be doing her CXEs next year and hopes to be a doctor. 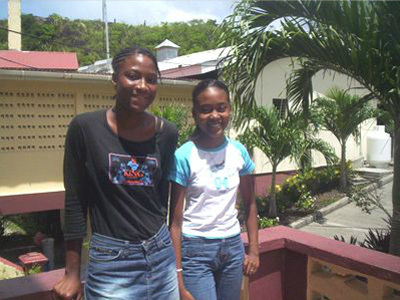 Vernessa Harford (right) gets help with travel to St Andrew’s Secondary School where she is in the Third Year. Vernessa’s family has experienced difficulties since the recent death of her mother but with the Trust’s help she faces a brighter future. 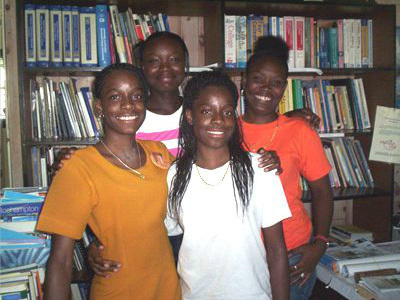 The Trust’s fab four at TAMCC Danette Charles, Nathalie Whint, Radisha and Makeda Mark (pictured) are all in their second year at the TAMCC doing secretarial and hospitality arts studies. They have been receiving support from the Trust to pay for their books and this year the Trust is paying their examination fees. Once they have completed their studies, they will return the books so that they can be used by future students – making the Trust’s funds go even further. On behalf of my parents and myself I express my sincere gratitude to you and your organisation for your generous contribution towards my education. lt is a joy and relief to know that organisations such as yours exist which understand that not all parents are capable to meet the ever rising cost of funding a child through secondary school. It is with relief that parents come to foundations such as yours to ease such a budget burden, knowing with joy that students such as myself now have the fullest opportunity to succeed. l wish God’s most bountiful blessing upon the J] Robinson Trust’s future and pray that its recipients may achieve success in all their endeavours. I hereby take this opportunity to extend my thanks to you and your organisation for assisting, by helping me obtaining books for the new school term. Your kindness and generosity will travel great lengths. I am writing this letter to thank you for assisting me with the funds for my Pitman Examination. I am very grateful for the help you gave to me. I plan to go to college to do Secretarial Skills and to work very hard when I enter into college and do my best. I always thought of myself to have a good future by opening a business of my own. I always pictured myself being independent and to be my own boss. Although I picture myself being independent I will like to be employed by some one for a few years to get on my feet a little. IFMSA Grenada Food Festival was a success! Jessica Pringle swims to raise funds for the JJ Robinson Trust. Summer Camp 2018 was too short. Rotary Club of Poole (UK) makes a great donation! The Garden Party 2018 was a success!